Find the location of the secret Battle Star and the hidden free Battle Pass Tier from the Season 5 Week 6 Fortnite Road Trip Challenge! Players who complete 6 of the Week Challenges will be awarded with a loading screen that contains a hint to the 6th hidden Battle Star location. 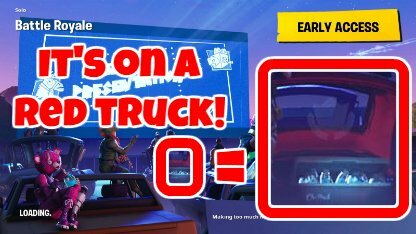 The gang is watching a movie at the Risky Reels drive-in and the Secret Battle Star can be faintly seen on the bed of a red truck. Note: You can complete challenges from any 6 different weeks to unlock the secret Battle Star location. You don't have to accomplish weekly challenges in chronological order. Head directly to Risky Reels. 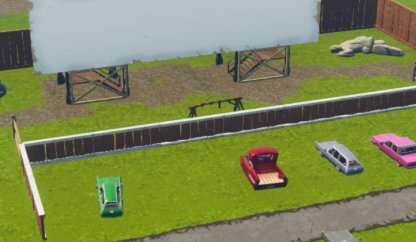 Look for the red truck directly across the ruined screen. The Secret Battle Star will appear when you approach.